The marquise shaped diamond features pointed ends with a curved middle for an eye catching look. With a larger surface area than any other diamond shape, the marquise shape maximizes perceived size and lends a unique look to any setting style. Originally commissioned in 18th century Paris by King Louis XV to emulate the smile of his mistress the Marchioness Madame de Pompadour, the Marquise harkens back to the glory of the age d'or, and is also an ideal way to optimise carat weight and elongate the finger. The marquise brilliant cut may also be referred to as the "Navette" shape, meaning "little boat," as the shape of the diamond is said to mirror the hull of a small boat. It is generally comprised of 58 facets, with 33 on the crown and 25 on the pavilion, although the number of pavilion facets may range between 4 and 8. Additionally, Marquise shapes are sometimes cut with a "French tip," which replaces the large bezel facet at the point with star and upper girdle facets. French tips are also used in the Heart and Pear shapes. Even though the optimal ratio of the Marquise is 2:1, the shape is more traditionally cut to ratios ranging between 1.85 and 2.10 according to personal preference. The Marquise can suffer from a so called "bow-tie effect" whenlight passing through the diamond casts a shadow across the central facets of the stone. This shadow can be reduced by altering the depth of the pavilion, and adjusting the angles of the table and facets to better diffuse light in the central area. This effect also occurs in the Pear, Oval and Heart shapes. The Marquise cut can maximise carat weight, making it appear larger than other stones of the same size and is often set with round or pear shaped side stones. As with other elongated shapes, the Marquise can make fingers appear longer and more slender. It is important that the marquise is not too shallow so as to avoid light passing through the back of the diamond and diminishing its brilliance and fire. Carat for carat, the marquise diamond has one of the largest crown surface areas of any diamond shape, making it a good choice when trying to maximize the perceived size of a diamond. Symmetry is very important in marquise cuts. The two end points should align with each other, and the right and left sides should form a near mirror image. Even a slight misalignment in the points can result in an off kilter look in the final setting. For this reason, excellent or very good symmetry is strongly recommended. A marquise diamond should always be set with prongs to protect the two points (the most likely location for chipping). Because these points were once nearest the outer edge of the rough stone, flaws such as naturals, extra facets, and other inclusions may be located here. Since the points are covered by prongs, these flaws will be invisible once the diamond is set. The only remaining concern would be if the flaws are significant enough to affect the stability of the diamond (this is extremely rare, however). Evaluating color in a marquise cut diamond is subjective. Keep in mind that many buyers may actually prefer the ever so slightly warmer colors of a G-H diamond over the cool colorlessness of a D-F diamond. In fact, most of the premium in price associated with a marquise cut diamond at the higher end of the color scale is driven by supply and demand; customers want the D-F color grades, and are willing to pay a premium to get them. In a world without diamond color grading, the price premium for higher grades would be much lower, as the actual differences in color are difficult to perceive. The Marquise cut first appeared in Paris circa 1745 and its fascinating history can be traced back to the height of the French monarchy. King Louis XV commissioned his court jeweller to create a diamond that resembled the smile of his beautiful mistress, the Marchioness Madame de Pompadour. A well educated and intellectual woman who exerted strong political opinions on the French court, Madame de Pompadour was the official maitresse en titre of King Louis XV between 1745 and 1750. 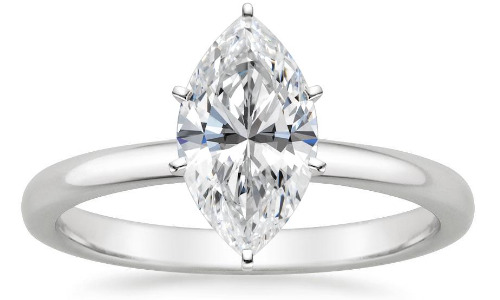 The shape was then developed and modified throughout the 20th century, evolving into the marquise brilliant cut as it is known today, seeing an especial rise in popularity between the 1960s and 1980s. The marquise cut first appeared in Paris in approximately 1745. 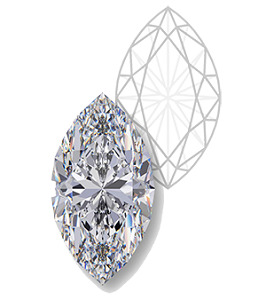 The fascinating history of the marquise cut can be traced back to the height of the French monarchy reign.